Pin the tail on the horse: Instead of donkey, have a picture of a horse. Blindfold kids and have them pin/stick the tail on the horse. The one who pins the tail closest to the correct spot wins. Arm wrestling match: Choose a representative from each group and get them to arm wrestle in front of the class. Idea is to show “victory”. There were 10 gates mentioned in the rebuilding of the walls. We looked at what these gates were used for and how they remind us of Jesus and His finished work on the Cross! Sheep Gate: Jesus is the Lamb of God who takes away the sins of the world. Fish Gate: Jesus died and resurrected after 3 days (just as Jonah was in the belly of the big fish for 3 days). Nehemiah 3:28 28 Beyond the Horse Gate the priests made repairs, each in front of his own house. The Horse Gate was close to the King’s stables. The men of Jerusalem would ride their horses out of this gate to war, and after the war, the king’s chariots will pass through the gates on its way back into the city in triumphant procession. 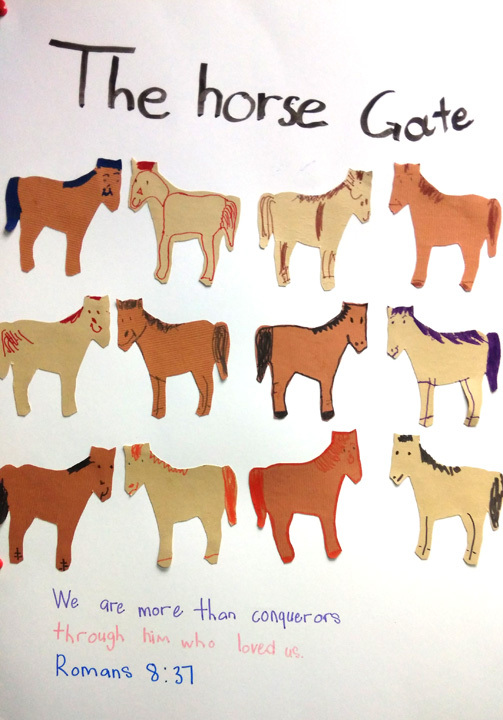 What does the Horse Gate remind us of? Jesus has won the victory. In Revelations 19:11-12, Jesus is seen on a white horse and all the armies of heaven on white horses were behind him. He wears many crowns on His head to show that He has won the victory. What victory has Jesus won? On the cross, Jesus defeated sin: His perfect life was sacrificed to pay the full punishment of sin. So sin — and its consequences (fear, worry, sadness etc) — no longer has any demand or hold over us anymore. By His resurrection, Jesus defeated death: By raising from the dead, Jesus showed that even death could not hold Him anymore. He had defeated death! Jesus = WINS! SIN = Lost! DEATH = Lost! When someone wins a competition, usually they win a prize. What did Jesus win? Jesus won our eternal life — Because Jesus defeated death, we can always have His life in us. We don’t have to be afraid of death because we know we can be with Jesus forever. 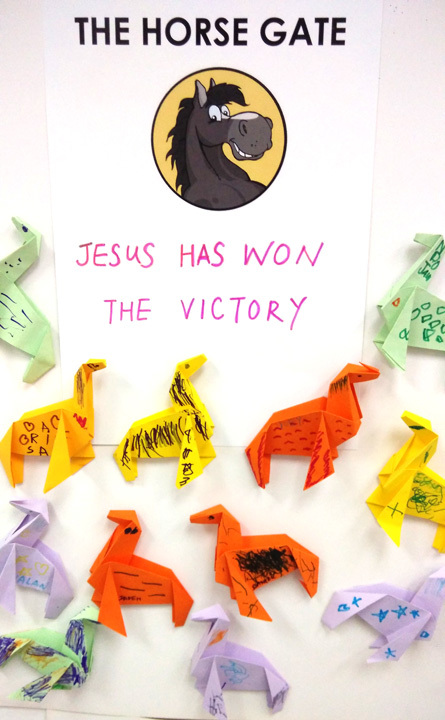 Horse Gate reminds us that Jesus has won the victory for us! Do you notice something? Jesus is the one who won the victory. Why is it we get all the prizes and blessings? That’s right! Jesus took all the bad we deserved (punishment and death) so that we can have all the good things that He deserved (blessings and favour). He won the victory so that we can enjoy the relationship with God and all the good things He has in store for us. That’s what the Bible means when it says we are “more than conquerors”. Rom 8:37 No, in all these things we are more than conquerors through him who loved us. Story of the boxer (optional): There was a very famous boxer. He trained very hard, day and night. He took part in a very prestigious boxing competition. He beat many opponents, round after round, until finally, he won the final round and got the championship medal! He also received the prize money of a few thousand dollars. He was the champion, the conqueror! Everybody cheered for him. But when he went home, the boxer greeted his wife and handed her his prize money so that she could go and buy herself something with it. The boxer was the conqueror; but his wife was “more than a conqueror” because she received the benefits of the prize money! Memory Verse: Rom 8:37 No, in all these things we are more than conquerorsthrough him who loved us. Aku mengutus kamu untuk menuai apa yang tidak kamu usahakan; orang-orang lain berusaha dan kamu datang memetik hasil usaha mereka. Ethereal theme. Theme images by Terraxplorer. Powered by Blogger.